The game's payment model will keep the product in Square Enix's hands. Developers have offered a lot of justifications for the subscription MMO model, in which players shell out a monthly fee for unfettered access to more or less everything in the game. As free-to-play games offering Ã -la-carte gameplay options become more and more popular, fewer MMOs can stay afloat by asking the player base to pay for its fun up front. However, Final Fantasy XIV: A Realm Reborn remains unmoved on the benefits of free play. As a justification for keeping the subscription model after the troubled MMO's upcoming relaunch, Square Enix states that the trust of its players and its financial independence are more important than the number of people playing. "The main reason why we haven't decided to take the free-to-play option is that, at the game's original launch, it didn't live up to expectations and it let down a lot of fans ... We want to regain that trust and to deliver on past promises," says Naoki Yoshida, the game's director. The link between fan loyalty and subscription fees may seem tenuous, but Yoshida clarifies that this payment method is Square Enix's way of ensuring that every FFXIV player has constant access to every single facet of the game. Although Yoshida is opposed to serving up the game piecemeal, however, he has no aversion to the free-to-play model in general. "It just really depends, and it's hard to say which one is better." Another reason Yoshida cites for the subscription model is Square Enix's lack of outside investors for the game. "We'd have to pay our investors back, and free-to-play is an option to get that money back to investors quickly," he explains. While free-to-play can often rustle up large sums of money through microtransactions, Yoshida wants to ensure that FFXIV is beholden to no one except its parent company. "Final Fantasy XIV: A Realm Reborn is a product that is independent to Square Enix. All of the money's coming from us, so we had more time to put it into what we wanted to do. We're not in a rush to pay anyone back." Square Enix's commitment to comprehensively fixing FFXIV's problems is admirable, but the game already took a serious blow on the chin after its unsuccessful initial launch. Wary gamers will be hard enough to entice without the added burden of a monthly subscription fee. On the other hand, if FFXIV turns out to be as strong as Yoshida hopes, tentative players shouldn't mind dishing out a little money for it. 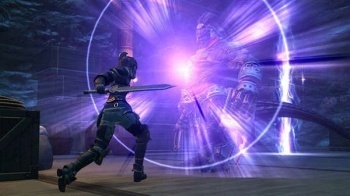 A Realm Reborn is currently in alpha tests, and should launch in early 2013.